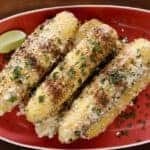 Grilled Mexican Street Corn gets a makeover! Easy to make, this is a delicious way to a cook a summer favorite – fresh corn on the cob! In a small bowl, stir together mayonnaise, cilantro, olive oil, lime juice, lime zest, chile powder and cayenne. Place cheese in a baking dish or large plate. Cut off corn silks from top of corn. Heat grill to 350°F to 400°F. Grill corn for 5 minutes, turning occasionally. Using a heat-proof gloves or pot holders, remove the husks and silk, then put the corn back on the grill. Turn the corn until it is lightly grilled on all sides. Remove corn from grill. Brush herb mixture over each ear of corn. Roll corn in cheese. Squeeze lime wedge over corn. Note: Rather than grilling, you can microwave the corn. Cut off the silks, they can burn in the microwave. Arrange the corn evenly in the microwave and cook on High. Cook two ears for 5 to 6 minutes, and add one to two minutes for each additional ear of corn. Let the corn cool down for five minutes before husking. Cooking technique from Eating on the Wild Side by Jo Robinson.